Here at RTT Travel we specialize in getting our customers to desirable destinations offering easy, safe and satisfying tours to places throughout Europe in a timely manner, knowing that we all have time limits to meet. However, on Tuesday we got to go a bit further, in fact all the way to the "Far East." How did we manage that? Well, we did it the easy way and went to the newly opened P.F. 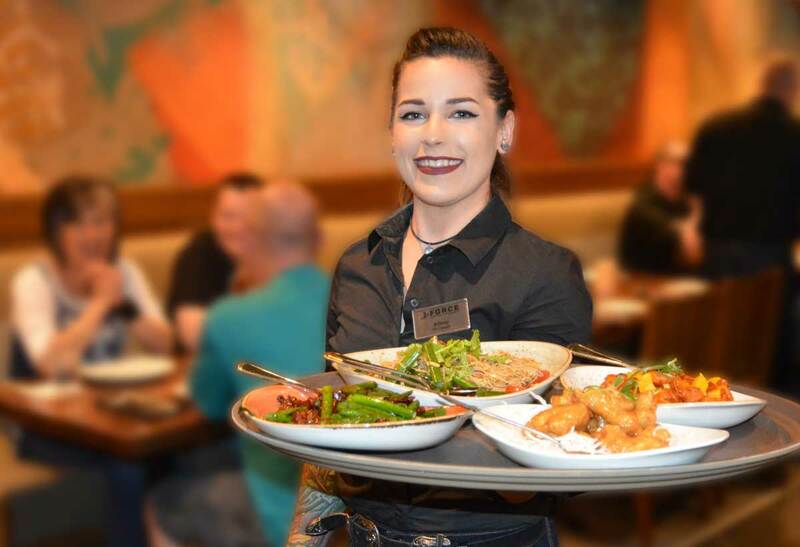 Chang's restaurant at the Enlisted Club on Ramstein Air Force Base! We were greeted by friendly staff, quickly seated and handed an extensive menu loaded with an assortment Asian dishes. Our waiter, Michael, explained that everything from the kitchen and bar was made fresh daily, which we came to realize was absolutely true. Trying to decide what to order wasn't easy, every offering sounded delicious.Excellent descriptions were annotated with green leaves for vegetarian, GF-gluten free and red pepper for extra spicy. Dishes that are traditionally Cantonese, Japanese, Vietnamese, and Chinese were taking us there with our taste buds. Having made our selections, we didn't have to wait long before being served. Our group is quite diverse so we started with Lettuce Vege Wraps, Dragon Rolls, Wok-charred Brussel sprouts, and Chili Garlic Green Beans. Moving on to entrees we decided upon Kung Pao Shrimp, Mongolian Beef, Buda Feast, Coconut Curry, and Orange Peel Chicken. The descriptive adjectives being tossed around at the table were "outstanding, so fresh, so flavorful, amazing, and incredible." We must mention some of the non-alcoholic the drinks at this point too: Ginger Beer, Strawberry Cucumber Limeade and Chang's Coconut Cooler. No one could quite decide which one was best. As for dessert, selections such as New York Cheese Cake, Vietnamese Chocolate Lava Cake or The Great Wall of Chocolate made it difficult to choose. To enjoy an easy, affordable, kid friendly getaway to the exotic far east, look no further than try making P.F. Chang's for lunch or dinner. If your taste buds temp you to go a little further, stop by and see us at RTTtravel! Ann has worked for RTTtravel for several years as guide, assistant and customer service representative. She is actively involved in the preservation of Europe's Holocaust Memorial's and works part time as a part time teacher in the KMC.